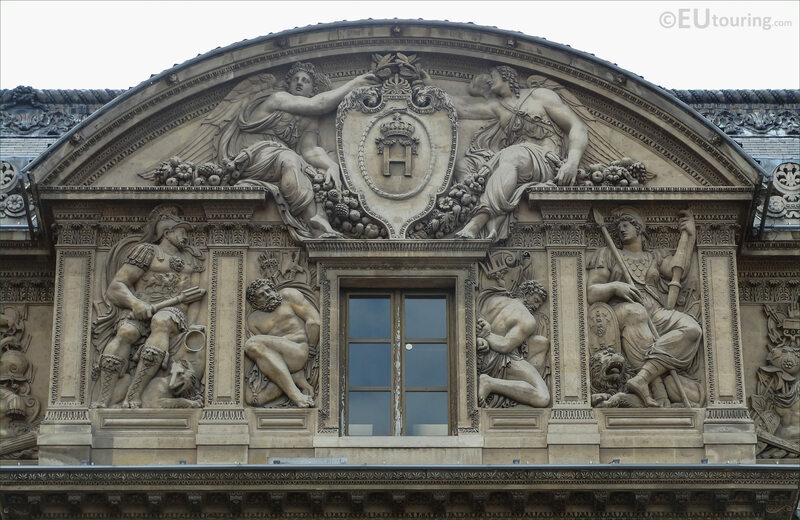 While we were at the Musee du Louvre in the 1st Arrondissement of Paris, we took these high definition photos showing a sculpture called the Prisonnier, which was produced by Jean Goujon. This first HD photo shows the sculpture called Prisonnier, which in English translates to the Prisoner, and as you can tell, this bas relief that was produced back in the mid 1500s, depicts a man partially kneeling with his hands tied behind his back. 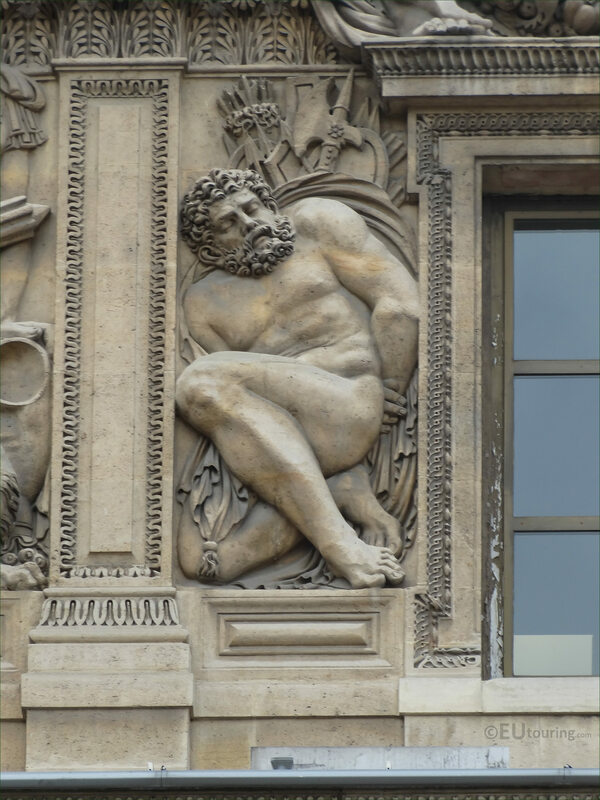 Yet here you can see a close up showing the detailing that went into producing this historical bas relief, which was by Jean Goujon who worked alongside the architect Pierre Lescot for the decorations on the new extension to the Palais du Louvre. But in this photograph you can see the entire top section of the Aile Lescot with its pediment and all of the different sculptures including the Prisoner, which were all produced by Jean Goujon who was documented as working on The Louvre each year from 1556 to 1562, although prior to this he worked on the Eglise Saint-Germain l'Auxerrois and the Fontaine des Innocents, with the reliefs from both now being held within the Musee du Louvre. 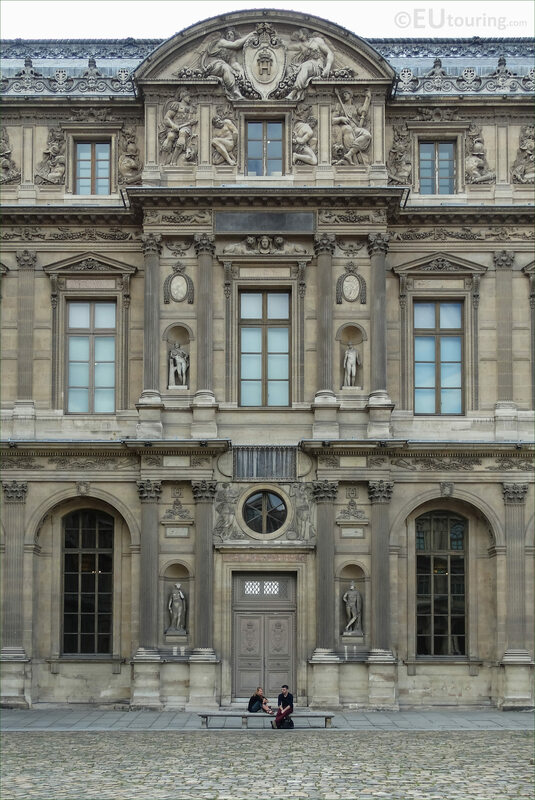 So you will be able to see the entire Aile Lescot historical wing of the former Palais du Louvre from the courtyard called the Cour Carree, and the Prisonnier sculpture is located to the left hand side of the window on the third level below the central pediment of this ornate facade.